What do The Smartest There Is, the Thing, and the Human Torch have in common? With Devil Dinosaur returned to his own time, Lunella has had to carry on saving the day on her own. And with Reed and Sue Richards still M.I.A., The Human Torch and the Thing have also suddenly found themselves as half of a super hero team. So what has Lunella learned from Ben and Johnny? How have they influenced her as her? And what’s in store for these three moving forward? We caught up with writer Brandon Montclare for more insight on MOON GIRL AND DEVIL DINOSAUR #27, which is now on sale! Marvel.com: The Thing has always shown up as a counterpoint for Lunella. He’s not the brainiest hero, but he has heart and determination. Would you say he has shown Lunella that there’s more to being a hero than just book smarts? Brandon Montclare: The Thing is one of my favorite characters as well as a great character to write. He’s got a worldview! As far as his relationship with Moon Girl, he’d be the first one to admit he’s the brawn to her brains. But she very much recognizes a kind of smarts in Ben Grimm: Yancy Street smarts. They grew up on the same Lower East Side block, albeit a generation apart. So she respects him in a lot of ways, and a lot more than some of the Marvel Universe brains she’s encountered. That being said: she doesn’t show it too often. She likes keeping The Thing on his (four) toes. 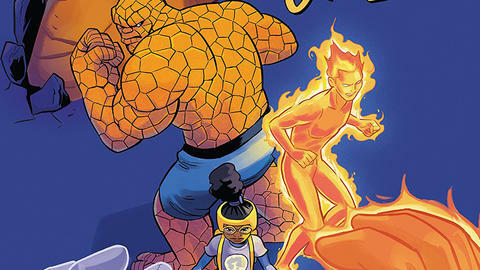 Marvel.com: Similarly, Human Torch’s approach to heroism differs quite a bit from Lunella’s. He has a brashness, and he’s a little more action-oriented, whereas Lunella takes a more scientific and analytical approach. Do you think she has gained any insight from him? Brandon Montclare: Moon Girl doesn’t can’t take Human Torch seriously. The guy saves the world countless times, and still she thinks he’s a bit of a dope! It’s definitely not fair, but Lunella always had trouble properly relating to people. So in “Fantastic Three” Natacha Bustos and I show Johnny being a hothead. We also show him being a hero; sometimes the most thoughtful of the bunch. The readers, I’m sure, tell the difference between his heroic strengths and shortcomings. Part of the fun about Lunella, however, is that she’s stubborn and misses a lot of things. She’s learning, though! Both Human Torch and The Thing are interesting visually. There are few super heroes more dynamic than Human Torch. It’s a new kind of visual for Natacha [Bustos]. And Tamra Bonvillain gets to “Flame On” with colors. Also, The Thing is one of the best character designs in the medium. And while he’s not a 30-foot dinosaur, Ben’s a big guy — so that’s given Natacha opportunities to juxtapose him with Lunella. In fact, the – literally — elemental designs and visuals of the Fantastic Four are something I definitely would never let go to waste. Even though “the Fantastic Four are no more,” readers have already seen hints of all four of their power sets. And more is coming! Tamra’s color choice is very idiosyncratic. And always very smart. When it comes time to reveal the Fantastic Four blues, it’s like you’ve never seen that shade of blue in this world before. That’s a special talent. Travis Lanham always has a lot of letters styles in Moon Girl and Devil Dinosaur. In addition to people talking, there’s a lot of narration. There’s also a lot of characters we need to “sound” different. Travis gave Devil Dinosaur his voice –and that was very important. You need every trick in the comics tool box to make “Mroo?” mean something to readers. In Fantastic Three, we have robots, cosmic beings, and more surprises. The letters have been on point. Adding Galactus and Silver Surfer is probably too much, to be honest. Given the opportunity, however, I couldn’t possibly resist. Marvel artists have been making Galactus and Silver Surfer look cool for half a century. Whenever I’m plotting a new arc, fundamental are opportunities to be visually interesting for the artists. With Natacha doing the line work–ideas are often first. “Wouldn’t it be cool to see Nat draw the Fantastic Four?’” Then hopefully I can also come up with a good FF story! Marvel.com: Also, with everything that has happened with the FF, has it changed how they relate to Lunella? I think maybe they understand her feelings of being an outsider a little more. And they gave her a bunch of Reed’s old things — it seems like they’re hoping she can maybe carry on his legacy. Brandon Montclare: That Human Torch and Thing look to Moon Girl to continue the Fantastic Four legacy is a big part of the story. It launches the action, and informs everything. What all three have in common is a recently broken family. 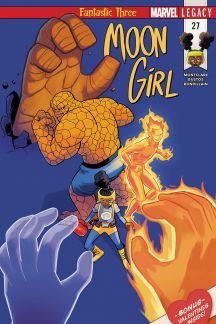 Moon Girl has returned Devil Dinosaur to his prehistoric home; Mister Fantastic and Invisible Woman are lost, leaving only half of a Fantastic Four. So they all get what the others are feeling — there’s no shortage of empathy. But families take time. Another part of Legacy, of course, is Moon Girl becoming integral to the Marvel Universe. She’s the smartest person in the world. That has consequences, and expectations to live up to. Marvel.com: Could you tease a little about what kind of threat we can expect to see from the Omnipotentis and what inspired your creation of it? Brandon Montclare: Omnipotentis! There’s a story behind that character’s creation. Focusing on the remaining members of Fantastic Four, I had pencilled in Galactus as the threat for the story. But as Ultimates readers know, Galactus has had some changes — and now he tries to bring life instead of death. I thought that was a cool angle. And it inspired a twist: what if Galactus was coming to Earth to warn humans of a pending catastrophe? Galactus used heralds like the Silver Surfer to portend his coming. So what if Galactus was himself a herald for something bigger? A Galactus for Galactus. And from there we came up with Omnipotentis. My only note was it should look related to Galactus. 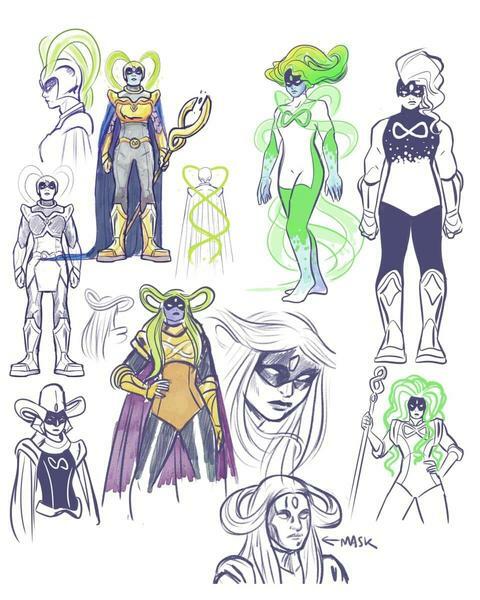 Natacha came up with the rest — including making it a female cosmic entity. Here’s some of her designs I think we can share. Natacha working through the visuals. You’ll have to wait for issue #28 to see the final Omnipotentis! Brandon Montclare and artist Natacha Bustos’ MOON GIRL #27 is available now!